A part of the business of government is to oversee openings and launches of public buildings and events. The files '81/3592 - Information & Public Relations Section - Invitation Cards' & '88/1487 – Public Information Section – Invitation Cards' contain a selection of official invitation cards and associate paperwork for their publication. Order for the publication of the invitation card for the opening of Belconnen Town Centre Library. The quotation from the Commonwealth Government Printing Office. The approval for the publication of the invitation cards. The finished invitation card for the Opening of Belconnen Town Centre Library 18th September 1981. These invitations document local events and visits by VIPs such as the Prince and Princess of Wales opening the Erindale Centre Library on the 25th of March 1983. Draft layout for the opening of Erindale Centre Library invitation card. The finished invitation card for the opening of the Erindale Centre Library 25th March 1983. Erindale Centre Library Opening Plaque. Here is a selection of other invitation cards published in the period 1979 to 1988. The launch of ACT Tourist Motor Vehicle Registration Plates 1st November 1979. Opening of Australian Paintings Exhibition 1830-1930 on 1st September 1981. Opening of the Gorman House Community Arts Centre 15th September 1981. Appointment of Peter Allen as Ambassador at Large for Canberra 29th September 1981. Opening of the Sir Sidney Nolan 'Rimbaud/Cezanne' Exhibition on 14th October 1982. Opening of Canberra Tourist Bureau in Melbourne 7th February 1983. Opening of the Sir Sidney Nolan 'Illuminations' Exhibition 2nd June 1983. Layout for the Jack Fingleton Scoreboard Dedication invitation. Dedication of the Jack Fingleton Scoreboard Manuka Oval 24th January 1983. Jack Fingleton Scoreboard at Manuka Oval. 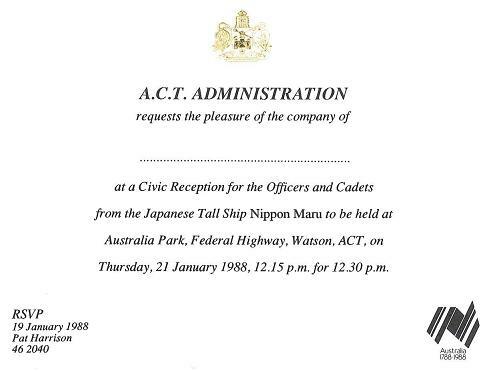 Civic reception for the crew of the Japanese Tall Ship Nippon Maru 21st Janurary 1988.